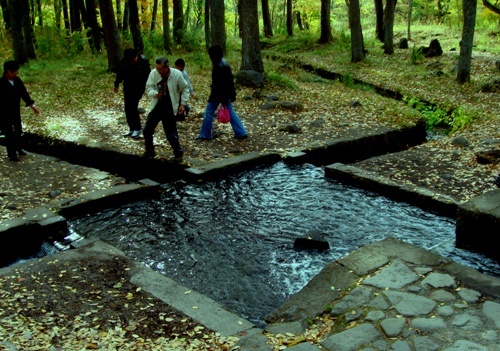 Sanbuichi Spring is said that was made by Takeda Shingen in 16th century, to divide the agricultural water equally among three, in order to solve the water dispute between the villages nearby.As upper photo, a triquetrous stone have a function to divide the water stream from right side. Getting to here is inconvenient. From Tokyo, go to Kobuchizawa by Chuo-line, and transfer to Koumi-line, get off at Kai-Koizumi station, and walk 10 minutes.